How do you get teenagers to buy into the whole “clean” room concept? I have just reorganized and decluttered my daughter’s room for the umpteenth time. It takes me days and I seem to have to do this every six months. I work with her on getting new organizing tools, on sorting things, identifying where to put them, etc. It only lasts so long and then she falls back into her old ways. How perfect that the first question is about teens, Mira! I, myself have a gorgeous 15 year old daughter, Dakota, so I hear your frustration. I am lucky in that my daughter is very organized, she folds her clean underwear impeccably before putting them away (I don’t even do that!) and has no problem letting go of clothing and other things that she doesn’t love. She wasn’t always like that, though, I promise. It wasn’t until I stopped bothering her and allowed her to feel the effects of her own disorganization that she started cleaning her room on her own. I believe that kids respond best when they are allowed to feel the consequences of their own actions, but I also respect that there are many different styles of parenting and there is no right and wrong, it’s really just what works for your situation. I am sure you have heard the adage, “pick your battles wisely”. I won’t belabor the point, but you may want to ask yourself how important is it? Chances are your daughter will only be living with you a few more years. I have found it’s more fun for me when I am friends with my daughter, rather than always nagging. Nagging is draining and depleting and disrespectful to both parties and it simply doesn’t work. (as I am sure you well know!). You may not want to hear this, but your conflict may be as much of a learning for you as a parent as it is about your daughter, if not more so! Most teens are not concerned with the state of their room. They are usually looking outward to being social, or are very involved with their passionate interests. (music, video games, clothes, sports, etc.). Having a clean room and an organized home may be a strong priority for you, but if it is not important to them, it will be difficult to get them motivated. Most teens use clutter, much as we do as adults, as a form of “power play” and rebellion to express their independence. They are in the middle of a most difficult and courageous task, that of individuating from us as their parents. When you let go of the need for their room to be a certain way, really deeply let go, there is nothing to rebel against, and so rebellion is not that much fun anymore. Your kids can surprise you when you actually let go and allow them to come to the decision to pick up for themselves. I have often counseled my clients with teens to make a “closed door policy”. This is an agreement with your teen that states that as long as there is no food or dirty/wet/moldy laundry in the room, and they keep their mess confined to their room only, they can keep it as messy or as neat as they want, door closed. If they break any part of the rule, however, they must leave the door open and adhere to a schedule of cleaning and organizing. Most teens find that fair and it allows peace to reign in the home once more. Everybody wins. While this concept may not work for everyone, it works well when the kid’s room is far enough away from the central part of the house that it is not a problem when guests come over. Yes, I mean YOU. You are their parent, and they have a filtering device that screens out what you say. Remember on the Charlie Brown cartoons, whenever the parents spoke, the ‘voices’ were always in the background and sounded like “wah wah wah”? That is often how it is with our teens. It’s funny how a friend of ours, or a family member can come over and say the same thing we have said 358,956 times and from them, they not only can hear it perfectly, but they agree! I have found this over and over with my clients. I will go and spend an afternoon cleaning up a room with a teenager and we will have a great time, they will help me develop some really creative systems, and the parents will cry to me in despair, “S/he would NEVER let me do that for them!”. Oh, well…Don’t fret, strategize…find a trusted adult that your teen can hear and ask them to help your teen get organized. Don’t take it personally, you probably were the same way when you were that age! If you do it for them, they have no consequences and little motivation to do it themselves. If you clean your daughter’s room every six months, why should she have to? All she has to do it wait until you get fed up, and voila! She has a clean room! What if you didn’t clean her room and she wanted to have friends over? She might be embarrassed. That would be a motivating force. If you are the one who is embarrassed for her, close the door. Mutual respect is critical during our kids’ teen years. We expect them to respect our wishes, but we forget that they have their own needs and wants and priorities that often differ from our own. You are certainly encouraged to have ‘bottom line’ ground rules, it is your home after all, but respectful boundaries and clear, firm communication works best. This is true with everyone, really, but especially with teens. 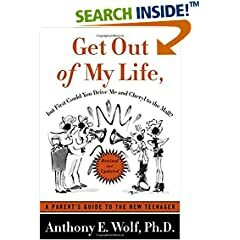 Often parents will allow their frustration and irritation to permeate the words they say to their kids and the kids pick that negativity right up and turn off the volume! (can you blame them?) We want them to do what we want them to do, but they have their own agenda! Just yesterday, after counseling a client last week to give her 16 year old daughter more structure and to hold better boundaries in their interactions, the client reported back to me that her daughter had agreed that she needed her mom to be more firm with her. It’s a difficult paradox to manage, teenagers want to be independent, and at the same time, they can grow their wings with far more confidence if you hold the space for them by setting the rules and sticking to them firmly and clearly. They simply don’t know how to do it! (and may be too embarrassed to admit it) For many kids (of any age), breaking down the task of cleaning their room into smaller, more manageable pieces is more effective than simply telling them to ‘go clean your room!’. Tell them to pick the clothes up off the floor, put away all the CDs and make the bed. So many times, we have the expectation that they will know what to do when we tell them to get organized. Often times, they don’t have a clue where to begin. In fact, I would say 80% of the adults who call me for organizing help say those exact words, “I don’t know where to start!”, yet we expect our kids to possess that talent! Most people are not born with a strong degree of project management skills! We have to learn them from someone we trust and feel safe with. If you can help your daughter break down the daunting task of cleaning her room while being non-critical, maybe even making a game out of it, you’re likely to see a magical change in both her behavior and your relationship. A system that works for one person, may not work for another. We all have a unique way of processing information and when our environment is not ordered in a way that is in synch for the way our mind works, we will never be able to follow that pattern and keep our space organized. You mentioned, Mira, that you organize your daughter’s room, when you do this, do you allow her to create the systems that she can maintain, or do you take the lead? Try letting her figure out some creative ways to put things away, even if they don’t align perfectly with the way you would have done it. I know this is tough when you just want the room to be clean, but this is a precious time when you can teach your daughter some important life skills and you’ll be amazed at how creative teens can be when we listen to them! This just in…can kids get organized? An excellent article by Julie Morgenstern on Motivating Teens to get Organized. 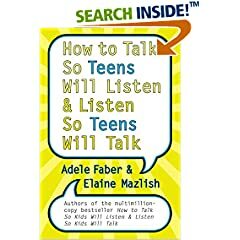 Adele Faber and Elaine Mazlish lay out some simple yet effective strategies for bridging the communication gap many of us experience with our teens. How did that happen? I read this book when my daughter was a baby and I vowed to re-read it when she was a teenager. It is an incredible look at the mind of teens, how soon we forget! 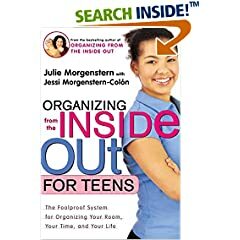 This is the book by Jessie Morgenstern-Colon, Julie Morgenstern’s teenage daughter, that goes along with her website to help teens get organized. I hope this helps and keep me posted! Do you have an organizing question for Jessica? Submit your question and let professional organizer Jessica Duquette help you clean up your own house and you can get free promotion for your blog. And join us on the third Saturday of each month to read our exclusive “Ask the Organizer” column with Jessica. Click on download button to get Conflict of Clans Hack Instrument P.S.Michigan Private Injury Attorneys. This was okay advice yet didn’t hit harder cases such as mine. My daughter refuses all . I remember when I would simply ask to just see the floor so I could make it in to vaccum and dust ect, now, she will literally take clothing Ive folded and put on her bed and chuck it to the other side iof the room ..I dont notice as I cant see that side unless I walk in and around the bed- Then I noticed her new puppy had pee’d 3 x in her bed and she refused to change the sheet! Capri sun and soda cans you name it total filth! I went in and took sheets off of course and began to sanitize and literally I was over welmed after that- The laundry, even new clothing with tags in with wet towels from her morning shower!She is 17 and has only became worse. I tried the door method long ago- I tried organizing with her long ago- Her own father has tried the organizing with her..Somethings go deeper I think- The question is what!? Parents just dont get the fact that we need to be independant! I wish my mom would stop nagging me! Deep down i probably dont clean my room just to infuriate my mom! Well, i’ll be showing this site to her – maybe THEN she’ll get it! That’s about the worst advice I’ve ever read! Culminating with, “I’d rather be my daughter’s friend, than….” what? Be her parent? Teach her to be responsible? Typical modern parenting advice, to base our decisions on “how we feel” rather than teach our children life lessons. As the mother of a 16 yo son, and a 13 yo daughter (and the 8 yo, but he’s still at that delightful age!) I can relate so well to this! Thank you. I have left my daughter to her own devices sooo long, whilst secretly (and not so secretly) despairing of her mess… then a couple of weeks ago she wanted to have a friend over – and I told her Yes, if you’re room is tidy! Voila! AND it’s been ‘almost’ door-openable ever since!! My 16yo son, however, is another matter. He’s been a tidy boy for years now, puts me to shame with his wardrobe clean outs (clothes dont fit? out they go! Toys outgrown? into little brothers room!) HOW did I breed THIS one?? He MUST be his Father’s son – and if that is the case, then it really IS all in the gene’s!!! Thanks Jessica for sharing this with us all – and thanks Susan and Janice for inviting her. Wonderful and timely advice. I’m going to link to you tonight. Thanks! I have to totally agree. When I was nagging our son to keep his room clean, he didn’t hear me. Than I just gave up. I let him be, have his dirty cloth in the hamper (at least he did that) and the rest was his responsibility ~ with his door closed. It came to the point when he wanted to have friends over and he started to pick-up. Now, he still lives at home, he is 21 and he even cleans his own bathroom…No nagging was for us the best solution. Thanks Jessica. I am going to try to implement some of your strategies (especially the closed door) and see if I can reduce MY level of stress. I believe you are probably right in that she may never outgrow this until she has a place of her own, I guess at this point the best I can hope for is to set a reasonable example of tidiness and just go from there. Thanks for answering my question. Excellent advice. It’s so easy to forget that some things just aren’t worth the battle and others are. A messy room falls pretty low on the list…thanks for the reminder. Ditto Janice, although my mom isn’t the one I wish for… she’s a little more uh, challenged than I am in this area… not a good thing! I need a pro, for sure. I know what I’m getting my nieces for Christmas. Thanks! I am fairly new to blogging, and this is my first visit to your blog. What an amazing site!! You have so much to offer. I’ll have to spend a little time getting caught up. Wow, this really helps me out a lot! I fall into the category of being very frustrated with the messy rooms. I’m going to give that closed door policy a try. Wish me luck! Wow – Jessica that was great! 🙂 You included some really helpful information. I like how you highlight how overwhelming cleaning a room can be. Where does a teen start? I am an adult and I still want to sit down and cry and call my mom to come help me when I face a huge organizing mess. Organizing isn’t my gifting and I get overwhelmed. But I know from experience I just have to pick a few task to start with and get moving. A teen may not be able to do that. BUT as you pointed out – we can’t just come in and do it for them because a) they won’t learn and b) they don’t care when they mess it up cause they know you will come clean it up again. So helpful – and thanks for all the extra links and tips too!